A phenomenon called "sleep-texting" is on the rise, with sleep disorder specialists reporting that more and more people are texting several times a night while they're asleep, according to CBS New York last week. WebMD writes that teens are especially at risk of "sleep-texting," with more and more kids reaching for the phones during the night, sending texts, and waking up with no recollection of what took place. "Four o'clock in the morning, 3 o'clock in the morning -- it would just be a sentence of jumbled-up stuff," sleep-texter Megan told CBS New York. "I guess I got up and texted, and went back to bed, but I don't remember it." 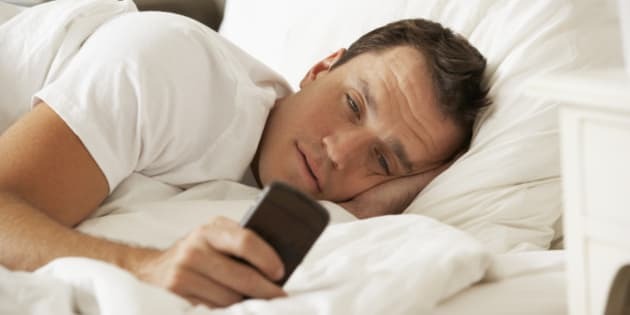 Aside from the risk of sending bizarre texts to your contacts, sleep-texting isn't good for your health in that it interrupts deep, restful REM sleep, experts say. "Sleep is a very important restorative process," Dr. Josh Werber, a sleep and snoring specialist, told US News. "And when we're not fully engaged in it, and not getting the amount we need, we're not having the same restorative effect on our brains -- and that affects our cognitive ability the next day." Best way to resolve the problem? Experts recommend shutting off your smartphone before bed or even moving your devices out the bedroom entirely. Also wean yourself off using gadgets in the evenings, in that research has shown that light-emitting screens from tablets and smartphone can suppress the release of the sleep-promoting hormone melatonin and enhance alertness, making it more difficult to sleep.